MILKY WAY, a Dufour 40E, uses her X-Drive carbon sails for offshore races. To make the sails bullet proof, the leeches of the sails have a taffeta layer. The leeches of sails take a lot of abuse. The back end of overlapping genoas get beat up every time the boat tacks as the leech drags across the shrouds and the mast. Racing sails get banged up even faster as eager crewmembers work hard to pull the genoa around fast, putting the sail under higher loads. Mainsail leeches also get their share of abuse when the sail luffs during hoisting, reefing and dropping. They can suffer even more damage in heavy winds when the trimmer flogs the main to depower the boat. The main’s Dacron leech tape, snapping back and forth, breaks down the sail’s fibers at its inside edge doing what sailmakers call “hinging.” Hinging can happen even faster when the leech line is too loose and the leech flaps violently for minutes at a time. To lessen this damage, UK Sailmakers can add to the leech a wide strip of finely-woven, light-weight adhesive fabric (taffeta) or Liteskin®. These protective layers reinforce the sail and move the main’s hinging point forward into the sail where the sail doesn't flutter as much. 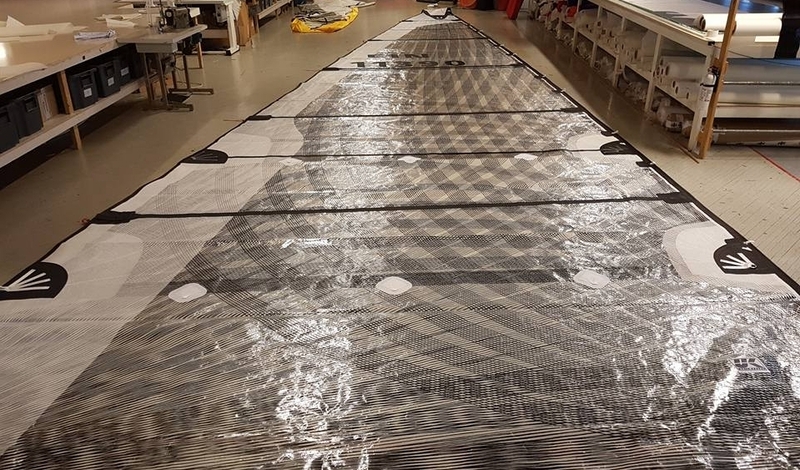 Shown in this picture is a Dufour 40E with carbon X-Drive® sails that have taffeta applied to the leeches of both the main and the part of the genoa leech that overlaps the mast. Call your local loft for more information about making your next sail last even longer. Left: This Salona 44 No. 2 was built to be used in the Sydney Hobart race. To give it extra strength and durability, the sail has a taffeta lay over the X-Drive carbon tapes on the part of the leech that overlaps the mast. Above: An X-Drive Carbon main with partial taffeta on the leech. Notice how there is more taffeta around the reef patches and a narrow band of taffeta above the reefs; this is done to save weight.